Bits of My Own: Part One of The Old Aviary is Finished! This took longer than it should have because of all the frogging. I decided that one of the silks from the Vicki Clayton package just wasn't right. The color description was for a "light beaver gray". The substitution color was a pale mint green. At first I tried to go with it, but by the time I got to the bottom, I decided that it just wasn't right. Soooo.... a lot of frogging. I removed all the pale mint green and replaced it with a grayish green silk in my Splendor collection. It was a little different in appearance but not enough to detract from it. 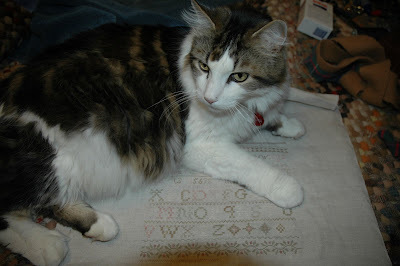 I finished up the large alphabet in the satin stitch. At the end of the row there are some medallions that are done in a rice stitch, and one eyelet stitch at the end. The rice stitch is a lot of fun and displays very well. 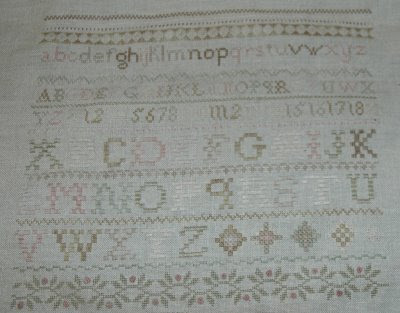 The next was the dividing row, which was done in an elongated smyrna stitch (over six). The last section is a twining vine with rose colored flowers. The vine and leaves are in cross stitch, and the flower in done in a Ribbed Spider Web Wheel (over 6). Oh my gosh! This stitch will drive you crazy! It is very hard to see the holes for this with 40 count! I just had a peek at Part 2. It looks a lot harder than Part 1! lovely stitching, the new color look great. Oh, but it is so gorgeous!!! love the colors and great job on the first part. Great first pasrt, Erica! I love the colours very much. It's beautiful, and I like the new colors.